Wine and cheese tasting, in a seminar format for a group of 20-25 participants. This format includes a brief presentation your company, and continue with a guided tasting of approximately four wines and six cheeses. We begin with an overview of cheeses and how they are made, with information about whatever theme we might be presenting (regional, style, comparative, etc). We would continue with a discussion of how wine is made (or other beverages, as appropriate: an Irish cheese tasting would certainly be accompanied by some guinness and possibly whiskey) and how to taste, the components and some vocabulary about wine tasting. We elicit comments and questions all along the way, keeping strongly in mind that there is as much entertainment as education in our presentations. We continue with the tasting, including exercises that encourage participants to discuss the cheeses and beverages amongst themselves, as well as sharing comments with the group at large. This format of program can be offered in a series, each session highlighting a different country or a different style of cheese. Wine and Cheese tasting in an open house format for a larger group of up to 70 participants. This format begins with a brief lecture (guests should be seated, theatre style) on the cheeses and wines to be presented, and then shift to an open house format. Stations with appropriately paired wines and cheeses are distributed throughout the space to encourage maximum movement and flow. We offer one to two wines per station, and at least four to six cheeses per station. The fluidity of this format provides excellent networking opportunities to the hosts, and keeps the event very relaxed. Epicurean provides all tableware, all handouts, and all comestibles. Rental equipment can be arranged. If you need assistance with locating a space, we can provide that. We can consult on the invitations as well. 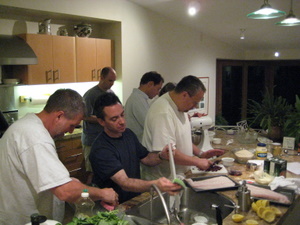 Hands-on cooking class, preferably in the home of one of the participants. We prepare a meal together, working on such skills as listening, cooperating, coordinating, sharing resources, relinquishing authority to another. The atmosphere is relaxed, non-competitive and fun. The resulting meal is shared by all participants, over which a conversation is encouraged to examine any new interaction paradigm that may have been created. This exercise should be immediately followed by a business meeting, in order to begin operating out of this shifted relationship. See more photos. "Susan catered two team offsites of mine involving more than 30 people each time. She planned out all the menus and created team-building events to prepare each dinner. She had to carefully plan everything in advance, as the offsites were held on an island in the San Juans. Everything had to be thought out, purchased ahead of time and then transported to the island. The results -- on both occasions -- were nothing short of amazing. She produced creative, delicious meals every time. She taught all who wanted to learn with acumen. And she brought a grace and sense of humor to all she did. I heartily recommend Sue."